Tops'l Beach Manor Unit 701 has recently been updated including new kitchen appliances, granite countertops, and new bedroom floors. The living area has amazing views of the Gulf and Topsail Nature Preserve. The sectional sofa provides plenty of seating for you and your family to enjoy the flat screen TV. The master bedroom also has great views, a comfortable king size bed, and en suite bathroom. The second bedroom has two twin beds and access to a hall bathroom. Both bedrooms have a flat screen TV. The kitchen is fully equipped to handle all your cooking needs. The dining area has seating for six with two additional bar seats. Enjoy free wifi and cable. 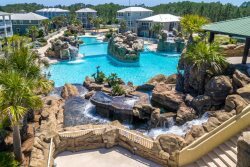 Tops’l Beach and Racquet Resort is located close to some of the area’s best attractions and activities. You will be within minutes of great shopping, dining, and entertainment at Grand Boulevard, Silver Sands Outlet Mall and Sandestin's Village of Baytowne Wharf. If you are looking for fine dining, enjoy the Ocean Club located onsite or venture over to Vintij, Bistro Bijoux, or Emeril's Coastal Italian. Tops’l is located in the center of everything with Destin just to the west and 30A just to the east!